Last night I went to http://www.huisvanbourgondie.nl/ to see " Will You Ever Be Happy Again? ". I really enjoyed it in so many ways! It was funny, full of energy, nostalgic, authentic and more. Will you ever be happy again? Yes and last night I was happy. "Will You Ever Be Happy Again?" uses documentary strategies to examine the influence of nationality on personal identity. 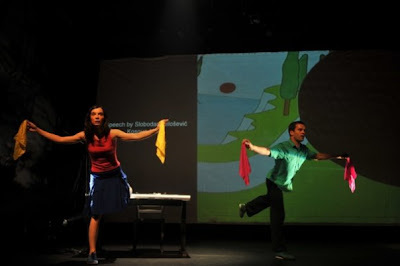 The production’s ingredients are autobiographical stories related by the performers – one Serbian, one German. These stories are based on a series of events from their childhood: games, primary school, sports days, etc. Through the sketched stories about good against evil (about a victim against perpetrator and about how easily roles can switch) the performance wanders between research and a ritual game that creates imaginary parallels between the two countries, repeating History just like History always seems to repeat itself. Great! You have a very inspiring blog, I'm following! 198, Butterfly: Design, Fashion, Art and Architecture. your blog too, Im following!